Felim Egan was born in lreland in 1952 and studied in Belfast and Portsmouth before attending the Slade School of Art in London. He spent a year at the British School at Rome in 1980 before returning to Dublin where he has since lived and worked at Sandymount Strand on the edge of Dublin Bay. He is known as a painter of restrained eloquence, who sparingly deploys a vocabulary of hieroglyphic motifs over monochromatic expanses of colour. His paintings are built up slowly with layers of thin colour applied to the surface and stone powder ground into the acrylic. The work is universal in spirit and emotionally intimate. His paintings are epiphanic, in that they convey to us the essential nature or meaning of something of which we were previously unaware. He is an artist of quite formal abstract images, and yet his work is tied to place, to the long horizons, big skies and empty sands of the Strand and sea beside his studio. 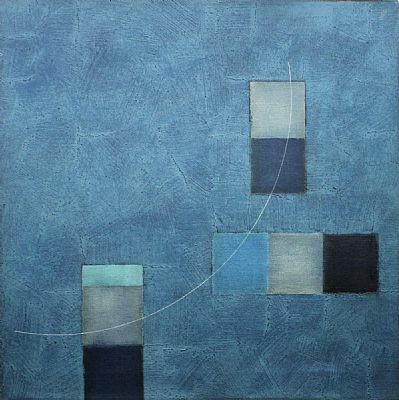 In this way his abstract paintings are almost landscapes, with a magical quality that his neighbour, the poet Seamus Heaney, has aptly described 'a balance of shifting brilliances'. Egan has exhibited widely across Europe with 54 solo exhibitions since 1979 including major shows at the lrish Museum of Modern Art, Dublin,1996 and the Stedelijk Museum in Amsterdam, 1999. In 1981 he represented Ireland at the Xie Biennale de Paris and in 1985 at the San Paulo Bienal. In 1993 he won the prestigious UNESCO prize in Paris, and in 1995 the Premiere Prize at Cagnes-sur-Mer. His work hangs in numerous public collections including the Stedelijk Museum, Amsterdam; the Irish Museum of Modern Art, Dublin; the Ulster Museum, Belfast; the Metropolitan Museum of Art, New York, and the collection of the European Parliament. Major Commissions include; Dublin Castle; National Gallery of Ireland: O'Reilly Hall, UCD; Meeting House Square, Temple Bar; Pavilion Theatre, Dunlaoghaire; City Quay Building, Dublin; New Providence Wharf, London, and the National Gallery of Ireland. Felim has just completed a large scale public 'sculptural work' at Cork Street, Dublin, October 2005. Felim Egan is a member of Aosdána.